Kolakham is a small village situated in Neora Valley Reserve Forest facing Eastern Himalayan peak. The spot located at an altitude of 6500ft is a paradise for nature lovers. This is a perfect getaway for those who wish to explore the pristine mountain wilderness. Each morning you can wake up to the sweet melody of birds. Kolakham is the most looked for after area for adventurous minded tourist who can take a challenge to discover the still unknown territory of Neora valley forest. The mesmerizing view of Kanchenjunga from Kolakham village, the jungle trail in Neora forest, the spellbound beauty of Changey waterfalls is a unique experience for anyone. Adventurous minded people can refresh their mind with a short trek around Kolakham. The Neora Valley forest is home to a wide range of flora and fauna. The forest consists of mixed species of flora like beautiful orchids, bamboo, rhododendron, sal, oak, ferns, etc. There are also many rare species of animals like Leopard, Himalayan Black Bear, Red Fox, Yellow Throated Marten, Sambhar, Kakar (Barking Deer), Leopard Cat and Ghoral. Variety of birds such as Orioles, Chir & Koklas Pheasants, Minivets, Redbilled Blue Magpie, White-crested Laughing Thrush, & Spotted Forktail & Birds of Prey include the majestic Golden Eagle, as well as the Himalayan Griffon and Lammergeier, also can see here. So Kolakham is a wonderful and fabulous destination for bards lover and nature lover. Adventurous enthusiastic can go hiking in the forest of course with all cautions as the chances of meeting wild animals are very high. For following more adventurous trails, it is always advisable to go along with an experienced guide. The nightlife of Kolakham is completely different from day life. The night full of stars & moonlight illuminating the surrounding area while listening to the sound of insects & rustling leaves will let you fill you are lying in the lap of mother nature. Nightlife is completely different it is like the forest came to life leaving you to mesmerize and spellbind. An ideal hideout from the world amidst the nature letting you enjoy the wonders of nature, Kolakham is simply the ideal spot to revive with the crisp mountain air & organic food with an awesome panoramic view of Himalayan range. Kolakham is the safe haven for the nature lover and wilderness explorer. Kolakham is situated on the fringe of Neora Valley forest. Enthusiasts people can enjoy nature trail along the picturesque green forest with a variety of birds and flora including some rare species of wildlife. Tourists can also go for a day trip to Lava, Rishop and Charkhole. Charkhole is a great place for tourists and gives an excellent view of Mt Kanchenjunga. Charkhole is an offbeat destination in Derjeeling District where nature welcomes with its abundant beauties and varieties. It is a very small village on the hilltop & indeed can be declared as a paradise of the Eastern Himalayas. 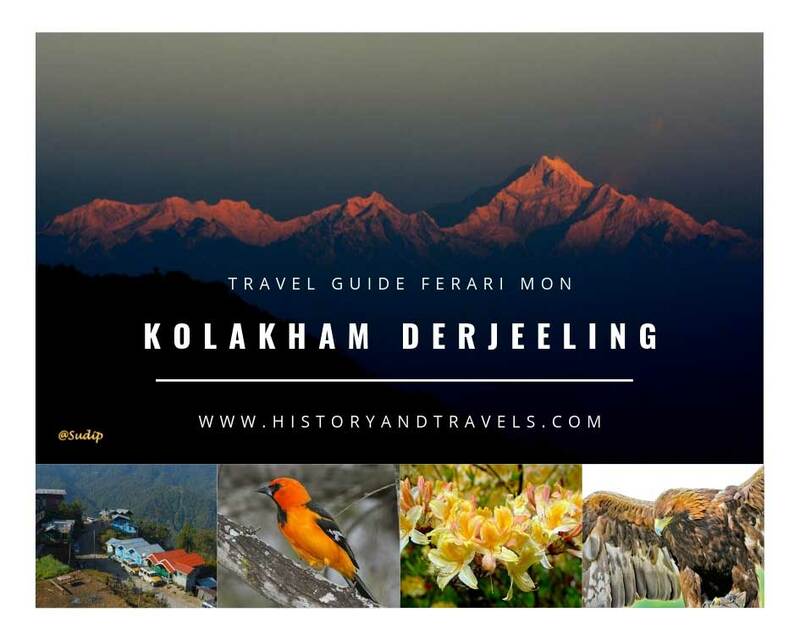 Hordes of Butterflies added more beauty to make Charkhole as one of the most favourite destinations for every kind of travellers visiting Darjeeling hills. Lolegaon is a small Lepcha village also known as Kaffer, has a spellbound view of Himalayan snow ranges over the entire horizon. Viewing sunrise over the snow peaks from Jhandidara, & the famous Canopy Walk (hanging footbridge over the Canopy of huge trees) is an experience of a lifetime. This is the only Canopy walk in the entire Darjeeling & Sikkim Himalayan region and must see for all the tourists visiting Lolegaon. A jungle safari by Jeep & trek inside the forest is a wonderful fabulous experience. This trip is a must to all nature lovers & bird watchers. The trip through deep jungle, full of tropical forest & most rare birds will make this trip memorable one. More adventurous people can go for a Rachela Trek towards the Aritar. The Jeep safari will start from Lava. Nature Wings can arrange Jungle Safari for its guests. Changi , Changey or Chagey falls just 3 km jeep drive and 1.5 km walk down through nicely built staircases and rest hut takes you to the most wonderful falls in the deep forest of Darjeeling Hills. It is the only falls in the deep forest which can be reached by tourists by jeep ride & a walk down to around 250 stairs. In the deep forest of Neora Valley forest with sounds of rare tropical birds like Wagtail, Minivet & others make your journey a memorable one. The picturesque Rishop offers a spellbound view of snowcapped Mt Kanchenjangha along with Mt Kabroo, Mt Kharg Mt Pandim, Mt Simvo and Mt Rathung. By Air: Bagdogra Airport nearest airport from Kolakham. Kolakham to Bagdogra Distance 120km. By Train: Nearest railway station New Jalpaiguri Station, distance is 123 km from Kolakham. By Road: New Jalpaiguri to Kolakham 123km,Kolakham to Kalimpong 32 km and 51km from Loleygaon. Santiniketan Basanta Utsav- Holiday Destination.